Don’t delete your drafts! You will hear this A LOT over the next couple of years as the open access movement gathers even more momentum and the role of green open access and institutional repositories is moved to the fore of the next REF (likely to be REF 2020). HEFCE have confirmed that all journal papers and conference proceedings submitted to the next REF will have to be made freely available in an institutional or subject repository (such as BURO) upon acceptance (subject to publisher’s embargo periods). A journal paper / conference proceeding that was not made freely available in a repository, such as BURO, from the point of acceptance will not be eligible to be submitted, even if it is made available retrospectively. This is applicable to outputs published from April 2016 onwards. It is excellent to see the Funding Councils promoting the open access agenda and embedding it within the REF. Making outputs freely available increases their visibility and is likely to increase their impact, not only within the academic community but in the public sphere too. It ensures research is easily accessible to our students, politicians and policy-makers, charities and businesses and industry, as well as to potential collaborators in other countries which can help with building networks and the internationalisation of research. Talking to academic colleagues around the University it is apparent that the normal practice is to delete previous drafts, including the final accepted version, as soon as a paper is approved for publication. This needs to change! Many publisher’s will already allow you to add the final accepted version of your paper to BURO (just not the version with the publisher’s header, logo, etc) and this is set to increase in light of the HEFCE consultation. Rather than deleting the final version, add it to BRIAN so it will be freely available to everyone in the institutional repository, BURO. 1. Log into your BRIAN account and find the paper. 2. One of the tabs is named ‘full text’. 3. If you click into this tab you will see a link near the Sherpa-Romeo logo to check your ‘publisher’s policy’. 4. 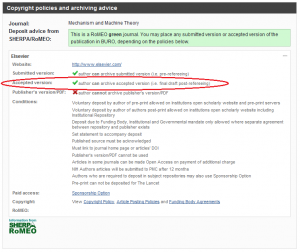 Click on this and you will see the archiving policy for this particular journal, clearly stating which version of the paper can be uploaded. 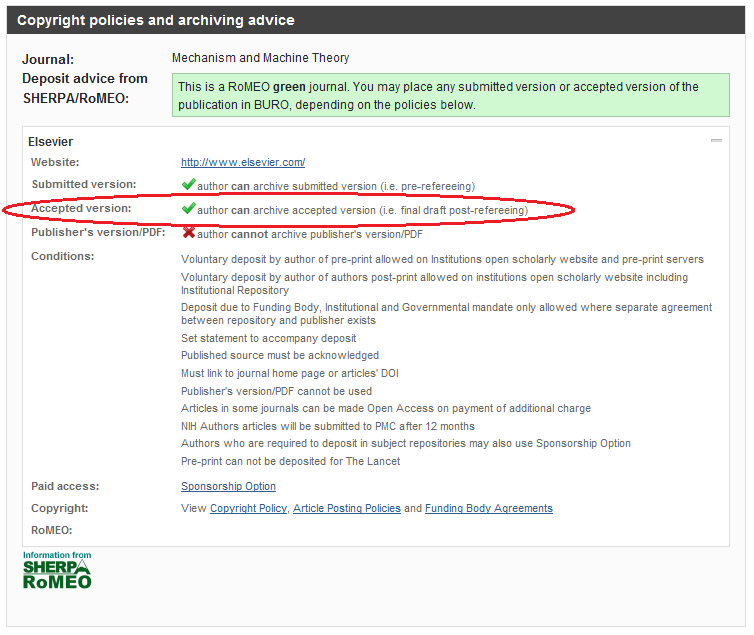 Ideally you are looking for your journal to be a green journal which allows the accepted version or (even better but quite rare, unless you have paid extra to make it freely available) the publisher’s version/PDF. See the screen shot. 5. Click ‘back’ and then click on the ‘full text’ tab again and you will see a link (in a blue box) to ‘upload new file for this publication’. 6. Upload the file and follow the onscreen instructions. 7. Your full text will then automatically feed through to BURO and be available open access in the next few days. LOVE YOUR DRAFTS – DON’T DELETE THEM – ADD THEM TO BRIAN!